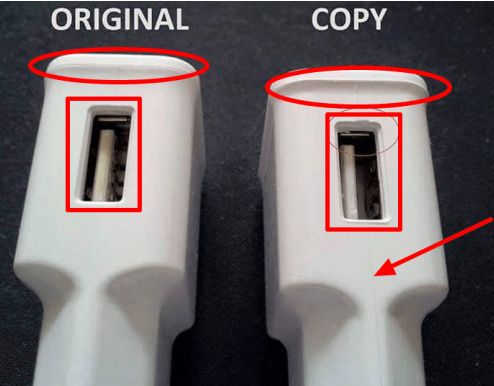 Fake USB cable – It is no longer news that when a popular brand launches a product, other manufacturers duplicate it and sell it in the market. These types of products usually don’t last and are also harmful. Fake chargers and USB cable usually look like the original ones. But if it’s not original, it will never be like original. 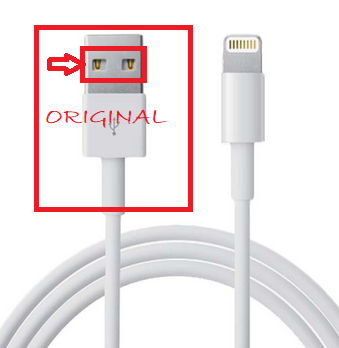 A lot of persons has fallen for the fake ones, thinking they are using original charger and USB cable. Fake USB cable usually takes long before it charges your device to 100%, some damages your phone battery, while some others after charging like 2-3 times, the charger becomes hotter than normal. Before you fall victim of Fake USB cable the second time, read the below. Take a good look at your USB cable and you should notice two holes that reveals the bus/contact. What you should look out for is the color of the conductor inside it. You’ll either find Copper or Aluminum. Golden conductor: if the color is gold, then it is copper conductor. Copper conductor has superior conductivity, the metal contains great tensile-strength, thermal-conductivity and thermal-expansion properties. copper has a conductivity of 100 percent IACS. Note: Before you buy any USB cable, make sure it is Golden otherwise, you will be buying a fake USB cable. Some manufacturers often use aluminum to produce inferior products because aluminum is cheaper than copper. The European standard plugs on the original Samsung charger features an extra layer of plastic on the lower end of the structure of the plugs to provide extra strength and support, which also enhances its overall durability. 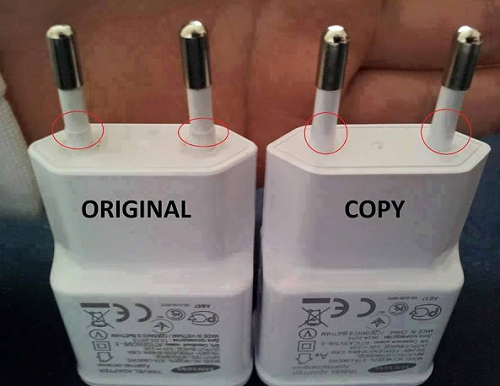 Whereas, on the fake Samsung charger you will notice that there are simple plugs without any durability structures. Well, always look out for the features as seen in the images above. If your USB cable bus conductor is aluminum, then you are using a fake USB cable. The fake is everywhere. However I do detect fake ones with my old HTC phone. If it’s fake it will display warning message “slow charging” but if it’s original it will charge fast. Nice one Yomi. This will really help. Will be carefully this time. Lots of fake out there. thanks for the update. nice info. I used tronsmart some yrs back. Their micro usb cable doesn’t last before the neck will start malfunctioning and the micro usb male part of the cable won’t key in firmly again to the phone port. Aukey is stil best as far as am concerned. Have used one of their micro USB cable for about 2yrs now with no issues. Though the price is a bit on the high side. USAMS is another good brand on aliexpress with cheap and quality products. Their multi charger is top notch. Cant say much of their micro usb cable yet as am stil awaiting my order. Thanks for this. But is it possible for Infinix to put a fake charger in box of a new phone? Thanks for the info, but am not still clear on how to detect the fake charger. But am clear about the USB. In short the USB am using presently is fake. Go for Xiaomi phones like Xiaomi Redmi 5A if you are on a tight budget (30-40k) but if buoyant go for Xiaomi Redmi 5 Plus or Xiaomi Note 5 (50-70k) instead , u r sure of regular MIUI update.